Our list of new books is now updated. Last month, the Law Library received books on a variety of topics, including updated print editions of several treatises that are highlighted on our guide to legal treatises grouped by subject at libguides.law.uci.edu/treatises. 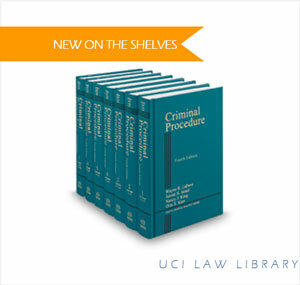 One of these new titles is the 4th edition of LaFave’s Criminal Procedure. Of interest to research buffs: In print, this set’s finding aids (e.g. tables laws and rules grouped by jurisdiction and a 76-page index) take up over half of the last volume. Online in Westlaw, this content seems to be entirely unavailable. As I noted in 2012 about another online legal research provider, librarians and other researchers are still waiting for “beautifully-designed and highly-usable digital titles from legal publishers.” For now, you can come visit us in the law library to browse the index. Check it out upstairs in the Reading Room at KF 9619 .L34 2015. Exact print-replica versions of Oxford University Press Scholarship Online monographs are rolling out this month. Print-replica PDFs for all UPSO law titles should be available by the end of March, 2016. The UCI Law community has access to a wide selection of Oxford titles covering law and related subjects. If you’re on the UCI network, see www.universitypressscholarship.com/browse?t=OSO:law . Our list of new books is now updated. Last month, the Law Library received books on a variety of topics, including several casebooks that’ll be on course reserve for Spring classes. Ambitious! Riveting! That’s quite an endorsement. Check it out upstairs in the Reading Room at KF 8748 .U76 2015. Our list of new books is now updated. 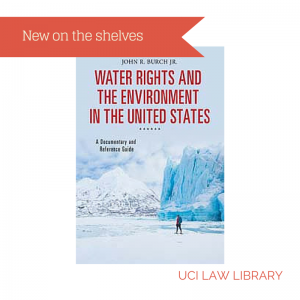 “[The author] reviews the conflicts among state, federal, and international agencies in dealing with water supply and points to competing legal rulings and laws as undermining the creation of a cohesive policy for all. Through an analysis of key documents, [the author] examines the recent calamities befalling the American water system—including droughts, oil spills, and natural disasters—and considers the future of water distribution to the American people. Organized into six parts, sections include doctrines and rights, waters of the West, border regions water management and flood control, environmental issues, and water supply and safety. Check it out upstairs in the Reading Room at KF 5569 .B87 2015. And for a more current, on-the-ground take on state and local water issues, come to the law school’s October 28 lunchtime talk with guest speaker Felicia Marcus, Chair of the California Water Resources Control Board. Check it out downstairs in the Stacks at HJ 2373 .M44 2013. 1 Dennis J. Ventry Jr., Book Review, 46 J. Interdisc. Hist. 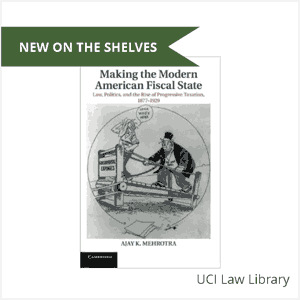 133 (2015), via Paul Caron, Ventry Reviews Mehrotra’s Making the Modern American Fiscal State, TaxProf Blog, (Jun. 3, 2015), http://taxprof.typepad.com/taxprof_blog/2015/06/ventry-reviews-mehrotras-.html. July was an eclectic month for new books, with subjects ranging from grocery store law, to a history of legal aid in the U.S., to law in the work of philosopher Slavoj Žižek. Check it out downstairs in the Stacks at K 3611.E95 L67 2015. 1. See, e.g., Patrick McGreevy & Chris Megerian, California Lawmakers Revive Measures on Assisted Suicide, Smoking Age, L.A. Times (Aug. 18, 2015), http://www.latimes.com/local/political/la-me-pc-california-lawmakers-bring-back-aid-in-dying-bill-for-special-session-20150817-story.html. 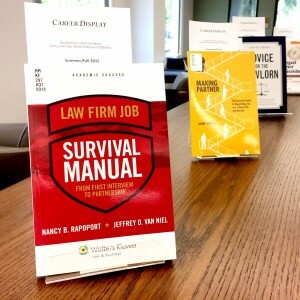 1L Survival Guide – Law Library basics, plus books and resources for law school success, legal research & writing, and exam prep. Encore – for books at UCI, plus journal articles from 5 databases. Westlaw, Lexis, and Bloomberg questions can go to representatives. Check our guide or ask a law librarian! Law Library career resources are a companion to resources and services provided by the UCI Law Career Development Office. In May, the Law Library received books on women and the law, human rights, intellectual property, and international law, among many other topics. Check it out upstairs in the Reading Room at K 1447.15 .D73 2015. Outdated copies from the personal collections of law librarians Ellen Augustiniak and Christina Tsou. 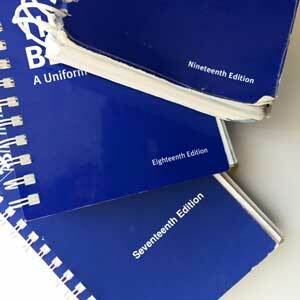 Time to toss your old Bluebook! The 20th edition is now available. 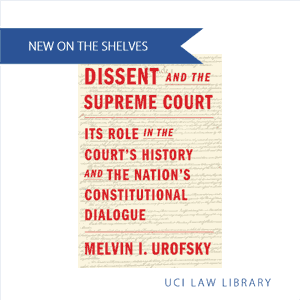 Here at UCI, the Law Library will get several copies in print. (Our vendor will be shipping them soon!) We tend to have a few on reserve, so ask for one at the counter if you forget yours at home. You can also check on the shelf out in the Reading Room at KF 245 U55.